LOL you are a total masochist frodo!!! Yippee I FINALLY managed to get that raft together, and got to the other side. I clicked on the rate again, and Violett jumped on it, and started heading back to the other side again. But then THE SHARK ATE MY RAFT!!! I jumped off just in time! But now, I'm back where I started, and no means to make a new raft. The pulley things don't work anymore. Genki, have you made any progress? Maybe the soap wasn't a red herring after all? Maybe you can find and use it the 2nd crossing? That would be incredibly sneaky and clever! If so, I think you're finished with that part. Try going back to the labyrinth and making your way to another red door. Yeah, I got... something. Not sure what it is, or what to do with it though. that huge spider is freaking me out! My computer - still the old one - got a temporary reprieve when we boosted our modem/router to give it more juice. Just enough to s l o w l y load Violett and hopefully play it. I don't know why but I am so drawn to this odd little game - I *must* play it!! What to say about Violett? It was on my wishlist for a long time before it showed up at Big Fish, so I jumped at the chance to finally try it... and bought it soon after. I hear that the folks at BF hated the game, and I can understand their frustration, but I'll get to that in a moment. You can set your resolution before you actually enter the game -- up to 1920x1080, and it looks great that way You can also choose the graphics quality, whether you want it Windowed or not, and if you select the Input tab, there are some other options there... I didn't mess with them, just played using the mouse. Once you're actually IN the game, you can choose your language, whether or not to show hints, and adjust the music and sound effects. We have a long intro sequence, but that's 95% of the story right there. This game isn't about the story, it's about exploring, trial-and-error, and puzzling out how to progress. There are no tiny little hard-to-see items like in The Tiny Bang Story, which is a huge plus for me All conversations are non-verbal, instead showing pictures in speech bubbles. There are journal pages that you'll find that will expand the story a bit, but they're not necessary except to be able to say that you didn't leave anything behind The localization isn't all that good -- some of the journal pages are hard to understand because of the bad English! Still, these pages aren't really the focus, and in one case, can actually throw you off of what you're trying to accomplish! Very sneaky! There is no tutorial to speak of, although the devs tried to show you what you need to do in some cases. Here's an example. When you start out you have NO idea what you're supposed to be doing, so you click on your location and a white hand moving in four directions appears in the bottom left corner. Huh? Turns out that when that little animation appears, it means you need to click-and-drag the cursor to move something around. You can't see from my screen above that the hint is animated, showing you that you need to grab the cage and swing it from side-to-side. 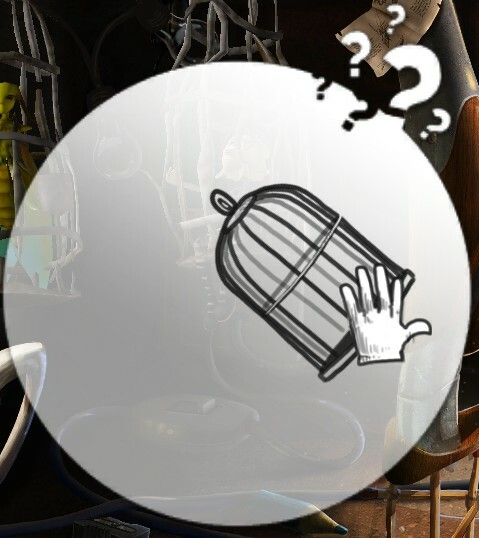 Sometimes if you wait, additional visual aids will pop up as part of that same hint. You can make it go away by clicking anywhere, if you don't want to see any more. Hit the ? again to see additional hints. 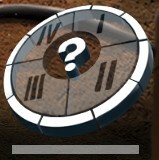 If you want to look at a hint again, simply click on the Roman numeral that corresponds with the one you want to see. Any items you collect will go into your backpack. To access your inventory, simply click on the backpack in the top right corner of the screen. You'll need to click on the item and drag it to where you want to use it on the screen. If it doesn't work, it's either too soon to do that action, or you're trying to use it in the wrong place! The answer is . . . connected to the reason why you're collecting weird sci-fi-looking pieces with a jewel in the middle. No, seriously During the game you will find three of these weird pieces, and guess what? We find three differently-colored balls, too! When you find the first piece, it will show up in the top left corner, and you'll find that there's a gauge there showing how many of the balls you've found. Surprise! That color of ball is no longer in your inventory (backpack,) they're where they belong in the artifact-thingy. Each color corresponds to a different power that you will gain once the balls leave your inventory: Floating, the power to make things grow, and the resistance to fire. I don't want to give anything away, but you will need as much of these powers as you can when you get to the final sequence of the game, so keep an eye out for those colored orbs! Now, about those orbs... They can be hidden anywhere, including secret compartments and on separate layers of the scene. Sometimes one will appear when you simply move to a different location on the screen. Click on anything and EVERYTHING on the screen that looks strange or out-of-place. You're likely to find one of those compartments. Also, when you hover your cursor over an orb, sometimes you'll see footprints (which is how you move about on the screen) or a door (which is how you move to the next location.) Go ahead and position your cursor as closely as you can to where the orb is sitting, then click. The game will register the collection of the ball before it will the movement of your character. I adore the artwork, and I really enjoyed the "figure it out" aspect of the game -- very reminiscent of the Amanita style. I really would have liked to know WHY I was collecting things, but despite this gripe, I still loved playing Violett. Recommended for those who enjoy this style of game, for certain! I am loving hearing about all of everyone's reactions to this one. Even though I can't/won't play it myself! Keep on with the fun for me you guys! You are my alter ego on this one!